Each year thousands of people look forward to a long awaited summer holiday. They seek out warm-weather destinations, in the hope of finding sun, sea, and soft sandy beaches. Travelers avidly scroll through the listings of beach rentals, in search of a superb Airbnb beach house – a place that offers leisure, pleasure, rest, and relaxation, a place where they can forget about the stresses and strains of the daily grind and just enjoy life. Could your Airbnb property be the perfect beach house? Are you ready to welcome summer guests? It’s time to turn your Airbnb beach house into a fully booked summer retreat! Simply follow our top tips and you will soon be on your way to providing a top-notch experience for your guests and earning yourself five-star reviews. It’s time to give some thought to your Airbnb beach house design and décor – does it grab the attention of potential guests? Does your rental stand out from the competition? Your beachfront Airbnb property should look like a classy summer retreat, so you need to inject a coastal living vibe into your property. We’re not suggesting you fill your home with nautical trinkets. You don’t have to add seashells to every surface and hang a large life preserver on the wall! We’re thinking of a low-key sophisticated approach – embody that seaside feeling by using color, texture, and subtle maritime and beachy elements. 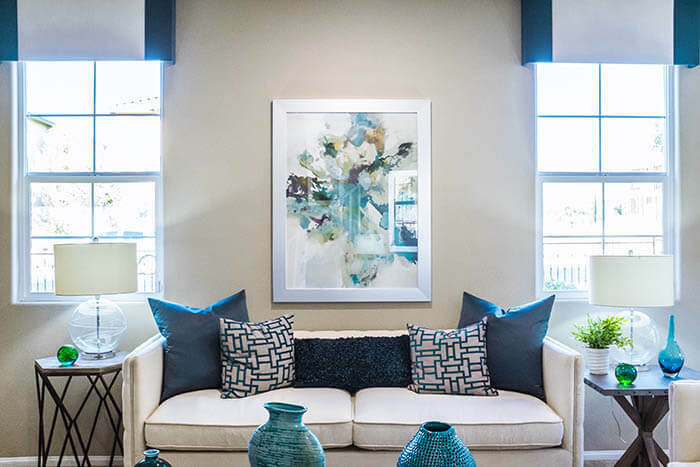 Set the mood by selecting summer hues, light colors such as beige and white work well. Then add a few splashes blue, turquoise or yellow to complete your coastal look. Compliment the theme with a few special touches such as driftwood picture frames filled with photographs or paintings of the ocean and coastline. Consider what it is your guests might want to see in your Airbnb beach house, selecting key elements that not only blend in with the interior but also provide some function. For instance, invest in decorative fish wall hooks to adorn your walls, not only will they look pretty and tie in with beach-themed accommodation, but they also offer a handy solution for hanging up summer jackets. You’ve given your Airbnb property a beachy makeover, and now it looks the part, but as we all know, there’s more to life than just good looks! Travelers also appreciate convenience and functionality. If you want to gain favorable reviews you will need to anticipate the needs of your guests, select the right amenities and go beyond the basics. Looking for a simple way to increase guest satisfaction and gain positive feedback? Then, invest in a few beach towels for your Airbnb beach house. They are inexpensive to purchase but prove invaluable to guests. Who wants the annoyance of packing heavy beach towels in their luggage? Not your guests that’s for sure! 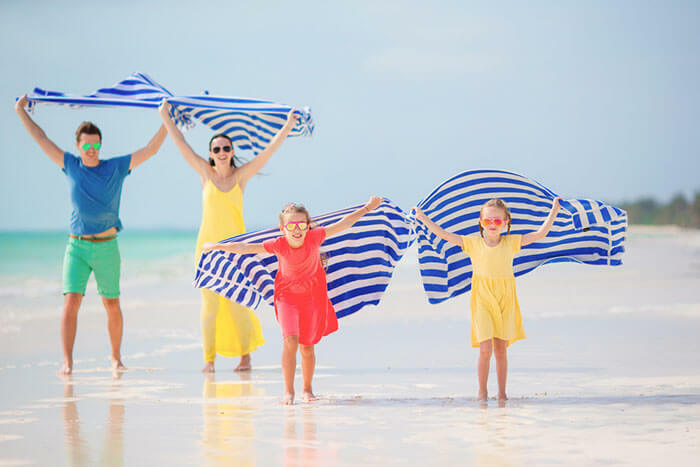 The added bonus is that you will also be saving your bathroom towels from premature wear and tear (guests might choose to bring those to the beach instead if beach towels aren’t provided). A simple umbrella, a few folding deckchairs, and a cool box could make the world of difference to your beach loving guests. Again, travelers don’t tend to want to bring along these items as they take up too much space. It’s a good idea to write your name and property address on each item for identification, and ask guests to return all items to their rightful place afterward so others can enjoy using them too. Organize an area for your guests to hang their towels and beach bags (which may well be wet and sandy after a day on the beach). Offer use of a clothesline or airer, complete with clothespins for secure items. It’s also a nice idea to create a spot for flips flops at your Airbnb beach house. Flip flops have a tendency to go missing, and guests don’t really want to play hunt the flip-flop before leaving for the beach! A handy rack or basket beside the door allows guests to remove and store footwear on entry – keeping footwear safely stowed away and limiting the amount of sand walked into your property. You’ve done your best to create an appealing design and furnish your Airbnb beach house, but have you considered your outdoor area? Well designed and arranged outdoor spaces bring people together and allow guests to enjoy the stunning views and vistas. Guests enjoy spending time outside, that’s why they choose to travel to warm and sunny destinations. However, the sun and heat can be relentless, so make sure you provide a few shady spots too. Take advantage of your outdoor space by providing comfy seating and a table for your guests. 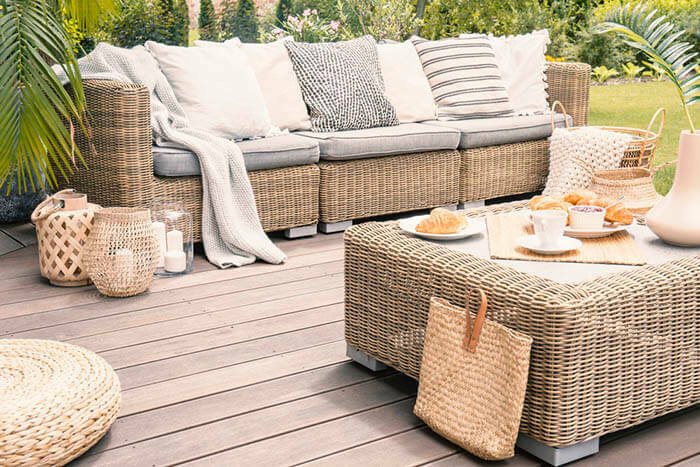 It’s wise to invest in outdoor furniture that can withstand the elements (living by the sea has many benefits, but salty air and constant humidity can damage furniture containing steel or iron). An outdoor shower can be a real bonus in your perfect Airbnb beach house. Guests will enjoy taking a refreshing shower on a hot day to cool off and recharge their energy levels. An outdoor shower can also prove useful in alleviating the problem of sandy feet and beachwear. Your guests can easily rinse off after a day on the beach, before entering your beachfront house. If you’re fortunate enough to own an Airbnb beach house complete with a pool, which is the most frequently searched for amenity among Airbnb travelers, make sure you furnish it well. Dot a few comfy sunloungers here and there to make the area more inviting, and throw in a few pool floats to entertain guests young and old. Cleanliness and safety should be your top priority, so make sure your swimming pool is always fit for purpose. Prevent potential accidents by adopting safety measures, such as ensuring accessible life preservers are nearby. Take care of your pool and get it fully inspected at least once a year. Make your guests feel at home by creating an insightful welcome book for your Airbnb beach house, highlighting the best places your area has to offer. You can include suggestions on the most delicious seafood restaurants, best tourist attractions to visit, and which snorkeling tours to take, as well as offering expert tips on local transportation and other points they might find useful.